Mice, some keep them as pets, but most either find them annoying or completely hateful. Whichever group you’re in, you’ll agree that mice will always need a form of control or containment. More importantly, controlling pests such as mice becomes a priority when you have food and produce to protect. Hence, gardeners often look for mouse traps to protect their vegetables, fruits, and other desirable plants. I can personally relate to the need for protecting plants and produce. Of course, no one wants to see bites out of their cherry tomatoes. However, gardener or not, I would prefer a more humane type of mouse trap as opposed to the sad glue or snap traps that people more commonly use. Therefore, I’ve listed in this article five humane and best mouse traps! So, if you prefer to catch pesky mice without killing them, you’ll want to continue reading! 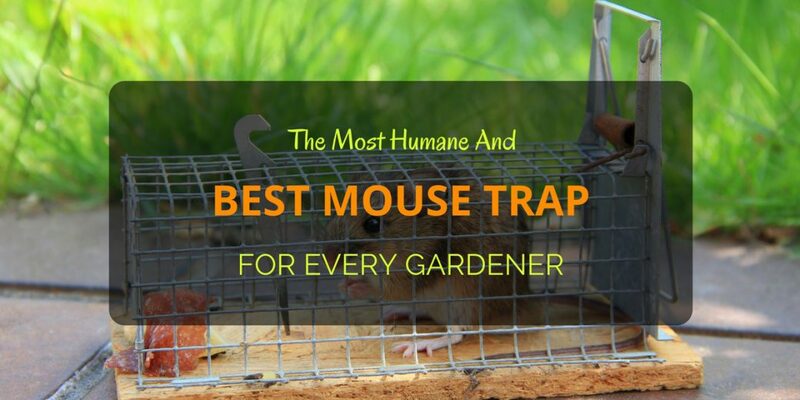 In this section, we’ll consider the important factors that will help you determine the best humane mouse trap for your home or garden. Go through these factors carefully, so you won’t end up wasting money on cheap and inferior traps that either catch rodents properly or worse, kill them in the process. The material that makes up traps will determine its durability, weight, and its aesthetics. Hence, it’s quite important that you pay attention to this feature of your next mouse trap. You’ll find the most common mouse traps made of wood, plastic, as well as metal. Of the three factors determined by the mouse trap’s material, the most important are its inherent durability. When hungry and stressed, captured mice tend to chew their trap or even themselves. Hence, agitated rodents may easily eat through plastic or wood, given enough time. Although metal traps may prove to be more robust, they do have the risk of corrosion and might just be the heaviest option. You may intend to catch only one or two unwanted visitors in your home or garden. It’s not surprising then that most traps only accommodate one mouse at a time. However, you’ll find that multiple-catch traps are much more convenient since you’ll only have to dispose of captured rodents every once in a while provided that they have enough food in the trap. Is the trap user-friendly? Snap traps run the risks of bruised fingers, will glue traps tend to leave sticky residue all over the place. In the case of humane mouse traps, you’ll want to consider how easy it is to set up the trap as well as release captured rodents. Additionally, you’ll want to inspect the trap trigger’s sensitivity. Look for a well-balanced trigger plate. At the right sensitivity, the trap will be highly efficient at catching even lightweight rodents. Too sensitive and the trap might be quickly set off by slight bumps, or by the bait that you place on the trigger plate. On the other hand, trigger plates that are not sensitive will only be set off by heavier rodents and will most likely miss lighter mice. Lastly, the trap must be a breeze to clean and maintain. Rodents are often filthy, if not riddled with parasites and disease. Hence, you’ll need to clean and disinfect the mouse trap thoroughly. ​Maximize trap efficiency by removing other sources of food. This process may require you to clean your home or garden of any food scraps thoroughly. Use effective bait such as peanuts, peanut butter, scraps of bread, or saltine crackers. Starting us off is the Smart Mouse Trap which may very well be the best looking trap on our list. Resembling a quaint Gablefront house with green translucent sides, the Smart Mouse Trap is a welcome addition to any part of your house or garden without screaming the fact that there may be a rodent nearby. Even after the trap catches mice, its green walls take away some of the repulsion you may have of handling rodents by slightly obscuring them from view due to its translucent walls. Additionally, this trap features portholes that allow the rodent to breathe. The Smart Mouse Tap works via a weight-activated trigger plate inside. You can lure the rodents in with bait that you can place on the trap floor, trigger, or on the wall opposite the plate. Afterward, mice will smell the bait and will eventually step on the trigger plate which activates the trap door. The trap works quite similar to a snap trap, but instead of finding a suffering or dead mouse, you’ll find a live one which you can release back into the wild unharmed. Just remember to check the trap every so often since mice will often panic when they’ve run out of food. A panicking mouse may start biting themselves or the plastic walls. Also, the Smart Mouse Trap has relatively thin plastic walls. Hence, you’ll either end up with a dead mouse or an empty trap that has been chewed through if you wait too long before checking the trap. Aesthetically pleasing design lets you place this trap anywhere in the home or garden without standing out. Another trap that shares a resemblance to a gabled-roof house is the Mouse Hotel, complete with roof shingles and windows. Also, it works very similarly to the Smart Mouse Trap with a trap door that snaps shut once a mouse steps on the trigger plate. Once the trap catches a mouse, you can easily release the little critter into its new home. Unlike the Smart Mouse Trap though, the Mouse hotel features a bait feeder, more compact design, and slightly thicker and more opaque walls. However, you should still check the trap periodically. Despite the thicker walls on the Mouse Hotel, hungry and anxious mice can still chew through the plastic with enough time. Although more sensitive than the Smart Mouse Trap, you might still need to improve the trigger plate’s sensitivity for smaller rodents. Mice can still chew through the plastic walls or escape by eating the latches on the trap door. Our next trap also features a trigger plate that triggers a trap. However, substituting for the transparent green walls on the Atomic Barbie Rat Trap is a sturdy aluminum wire mesh. Hence, you won’t have to worry about rodents escaping through chewed walls. Naturally, the Atomic Barbie Rat Trap won’t be as aesthetically pleasing as the first two traps on this list. However, it replaces that décor-worthy design with a markedly escape-proof construction and a trap size that may even accommodate medium-sized rodents. Additionally, this trap features a metal handle that allows you to carry the cage without ever coming into contact with the caught rodent. Despite its supposed corrosion resistance, I’d still advise you to dry the trap thoroughly after every cleaning. The wire mesh walls lets you add or remove bait without the need to open the trap. The wire mesh design will not hinder any smells or squeaking from captive mice. ​Since part of the trapping mechanism is located externally on top of the cage, rodents that climb onto trap may set it off. Large rodents and other animals may still chew the aluminum wiring. My personal favorite human mouse trap would be the Repeater Mouse Trap from J.T. Eaton, model number 421CL. As its name implies, the Repeater Mouse Trap is capable of catching multiple mice, and it’s not uncommon for people to find more than ten mice at a time! The J.T. accomplishes this with see-saw-like trapping mechanisms which allow multiple mice into the trap but blocks their escape! Design-wise, the J.T. Eaton’s makers designed the trap with a robust galvanized steel construction and a clear plastic window on the lid for quick unobstructed viewing. Unlike all of the other traps on our list, only this trap from J.T. Eaton is safe from a chewed escape. Additionally, you can open the lid for easy disposal of caught rodents, cleaning, as well as bait placement. The last humane mouse trap on our list would be a great alternative to either the Smart Mouse Trap or the Mouse hotel. The Vensmile Smart Mouse Trap features similar trigger plate mechanism with translucent plastic walls. However, the Vensmile does away with the house-like design and green plastic in favor of a simpler design and see-through brown plastic walls. However, I did notice that unlike the first two plastic traps on this list, the Vensmile’s trigger plate was remarkably more sensitive. Ultimately though, it will depend on your preference of design and color.